The shortest distance between two coasts is a wonky line. I just spent ten days in a car with a journal on my lap. As result, I did a lot of drawing. Not that drawing in a car is ideal. I am prey to carsickness so jolting highways and juddering views are usually not the ideal environment for the delicate stomach of my muse. Nonetheless, as I looked out the windshield four thousand miles, I was constantly drawn to draw. Aphorists say when you have a hammer, everything looks like a nail. And as I spent my whole day with a pen lightly gripped in my hand, everything looked like a drawing. The only effort required to start a drawing was to shrug off the cap and, whenever I wasn’t at the helm, I seized every excuse to draw (thank you, Tommy Kane). The unfolding miles inspired me to use the pen which in turn defined the journey we were on. I saw connections between things, I saw unusual shapes, I saw common things suddenly looking very uncommon. I was hyperaware of the light, of the weather, of the ravages of time. Holding a pen can be like donning polarizing sunglasses, sharpening everything in your field of vision. Now I am back on terra firma, I want to hold on to that urge and habit. To keep recording all the days that pass under my feet, to keep seeing even the most familiar landscape with the fresh eyes and open mind of a traveler. 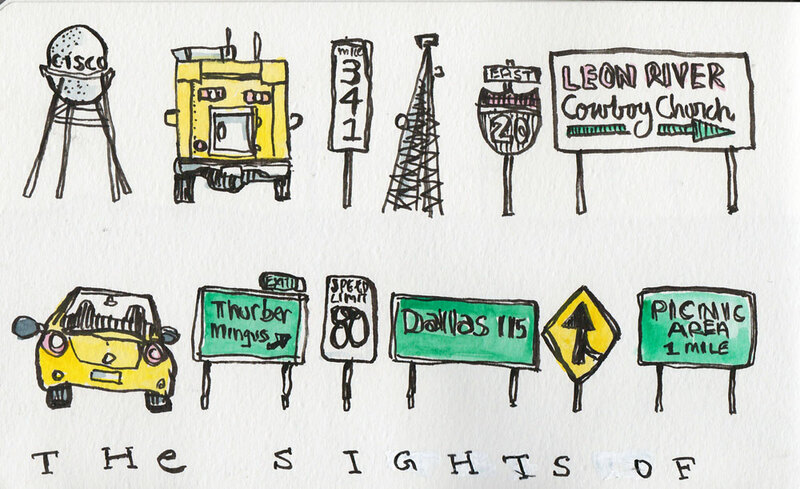 Traveling at 70 mph and sketching is a daunting task. Not a time for relaxation, as you have little or no time for that. It can be done, as you so well illustrated. But I always find, while not at the helm, I am still vigilant, alert and watching for hazards’ along the road. Not that I don’t trust the one behind the wheel, I feel like an extra set of eyes can be useful while traveling. I might add, it appears you made it to your destination, that is always a good thing. I try to draw when my husband is driving. It always cracks me up because in the end I need to blend multiple makes and models of cars into one while moving so fast. Sometimes the vehicle looks cool, other times it is incredibly ugly…a frankenbuggy. WOW, great lines. Well done drawing while moving! 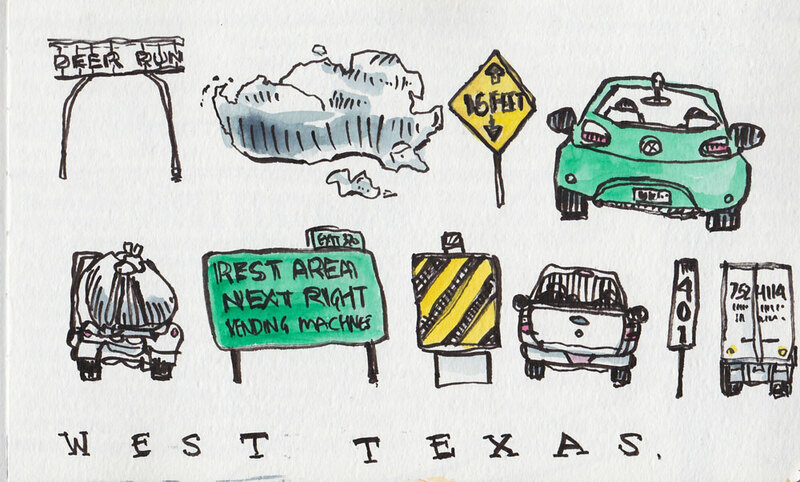 We went on a road trip from the east coast to the midwest earlier this summer and I was lucky enough to not be the one driving most of the time and for the first time in the car I picked up my pen and sketchbook and drew my quickly passing surroundings as well as my travel companions. So glad I did! Nice clouds! Having a hard time identifying….I’ve been in SBSKOOL for 6 wonderful weeks, and I have to drive myself everywhere all of the time….so drawing time in a car has to be just when I stop to sketch…but I too hope for a fresh and open mind where ever I am, so I do get your point. Been wondering if losing your garage studio has been traumatic. I love to sketch on trips while my hubby drives. Somehow the “going by” nature of the view makes me become alert to the need to stay in the moment, not miss it. My sketches tend to be a grab a barn here, a house there, a silo there, trees and plants and fields are a collage that often surprises me! 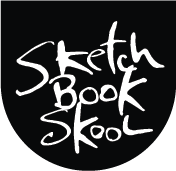 I alway carry a small sketchbook in my purse so I never get caught where I want to capture and be without tools….parking lots,restaurants , lighting on a building etc! So glad you shared the trip with us, Danny! Life is a trip…. Well it was a Most Enjoyable trip from this end. Wonderful & inspiring images. I too enjoyed your journey along the way (in the back seat so to speak). I can so relate, as on many cross country trips or half way cross trips I’ve done the same and seen life around me differently; that sticks. I continue to see everything as something needing to be drawn. My favorite drawing was when we followed another car for a long time that had four bicycles tied to it’s rear end and I got to draw them all. My wonder is how your dogs are adjusting to no longer having that sunny California back yard? Or did you move outside the CITY? I feel and am the same when I travel by car or train or whatever. Except that since I am not so good with the pen, I use my camera to ” draw” what I see. It’s an amazing feeling to suddenly see the world in such a different light. To be so much more aware of your surroundings. Thanks for a great post. Happy to know I’m not alone in this 🙂 Love the illustrations! This is exactly how I feel, except that instead of a pen, I have my camera…. Cool illustrations and well written post. Highly recommend it! Your art is a vindication of the conviction of the playwrights. The gun has been put to resounding use. I loved your writing style too.